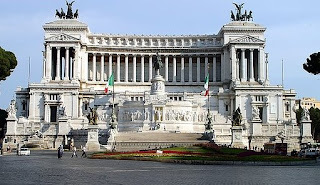 In the heart of Rome, at its very center, lies the Vittoriano: a giant monument in honour of Victor Emmanuel II, the king who united Italy. As so many large public construction projects it has a controversial and longwinded history. 1861: Italy united under King Victor Emmanuel II. 1878: Victor Emmanuel II dies; succeded by Umberto I. 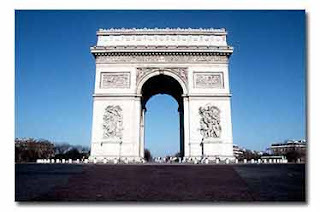 Law is passed for the erection of a commerative monument in the form of a triumphant arch, the only form worthy of a King. 1880: Public competition for the monument, won by a Frenchman. Outcome deemed unacceptable. 1882: Second competition; open only to Italians. Italian wins. Meaning of "Triumphant Arch" redefined to "forum open to the public". Instead of the originally planned Carrara marble an inferior type from Northern Italy is used; vicinity of origin of marble and hometown of Interior Minister supposedly coincidental. What the project plan said. 1900: Umberto I dies; succeded by Victor Emmanuel III. 1905: Architect dies, project continues. 1911: First inauguration of the Monument by Victor Emmanuel III. 1925: Second inauguration by Mussolini. 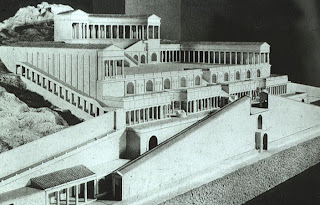 1935: Construction of the monument completed, 50 years after it started (in comparision it took the ancient Romans 8 years to build the Colosseum). 1969: Monument bombed, probably by right-wing group. Good intention, bad execution: monument remains intact. Closed down for "renovation". 2000: "Renovation" completed in only 31 years, monument reopened. Submitted by Wotan (not verified) on Tue, 30/09/2008 - 10:49. Lots of things I didn't kmow. And I live right there (NOT inside the typewriter, simply in Rome). Thanks!